Every once in a while it feels as if the development activity I frequently write about has stalled. Not that it truly has, of course, but given how long the average building project takes, once a building is well underway there is a long period of time when little appears to be happening. 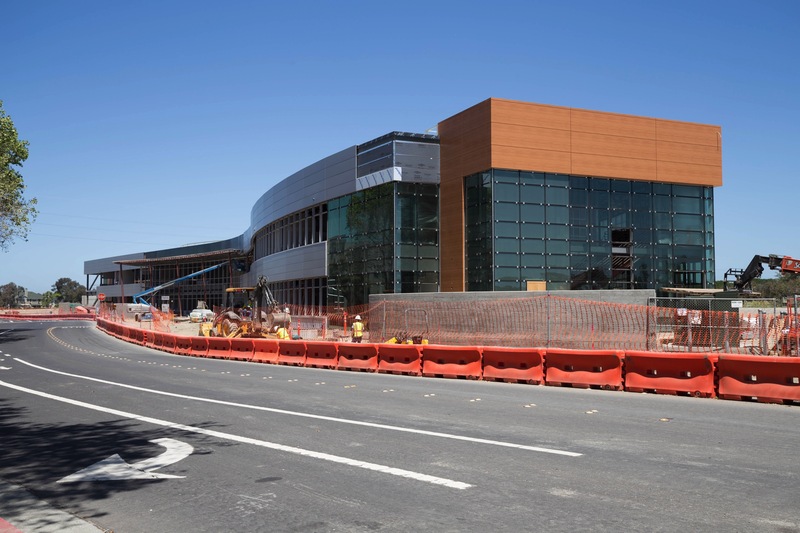 Even though there are a number of buildings under construction in Redwood City right now, most are in phases where, day-to-day, little appears to be happening. And although there are a handful of projects in the pipeline for approval right now, it will be a while before any of them get the final thumbs-up. What to do when there seems to be little activity to write about? To me, that’s a good time to create a snapshot of all of them, giving those of you who follow the large commercial and residential building projects with interest a concise picture of where we stand at the moment. And as you’ll see, although things may appear to be relatively quiet on the building front, there is indeed a great deal of activity going on at the moment. Of course, projects go through a number of additional steps, and some require multiple approvals or need to overcome legal objections—I usually write about those, too. But the four stages listed above are the big ones that I typically find worth writing about. Today I am going to focus on all of the projects that have been approved but have not yet been completed. Nearly all can be found on the city’s Development Projects page, where you will find a lot of useful information about each (and where you will also find information about a number of projects that have not yet been approved, and a handful that have been completed). I of course visit each project at each stage, where I take photographs and observe the project’s progress for myself. Thus I like to think I can add a lot of valuable background to the basic information provided by the city. Enough background. What follows are the observable status of each of the “approved” development projects on Redwood City’s list, as of mid-July 2017. This first is a project that is not listed on the city’s website. I walk by Sequoia High quite frequently and for some time now have been watching the construction on the Brewster Street side of the campus. This roughly $4 million project will result in a newly renovated Music Building that will consist of a band room, choir room, keyboard room, two break-out rooms, an office/music library and a costume storage room. This is another project that is not listed on the city website, but one that I and a lot of my readers seem interested in. I have written plenty about the rebuild of this fire-ravaged low-income apartment building on Woodside Road. When I last discussed it with the city, I was told that they expected construction to resume in April of this year. Unfortunately, as yet there is no sign of any work being done on the building. I’ll check again, but it appears as if the city may have to step in if this building is to ever get rebuilt. I wrote about this 8-story office project not too long ago, in my post Something in Common. Thus I won’t say much here, other than to note some good feedback I received from Mollie at Dostart (the project’s developer). First, she noted that the “tall, thin cast panels” (my words) are called “pilasters.” And then she pointed out that 1939—the central year on those pilasters—was when Redwood City’s annual Independence Day parade was first held. This 3-story, 10-unit condominium building on the site currently occupied by Thaibodia restaurant has been approved, but has yet to break ground. This 250-unit housing project (50 of those units will be affordable at the very low income level) has been approved but has not yet broken ground. Currently the site contains a medical office building. Although our downtown Starbucks has been in operation for some months now, the project remains on the city’s list only because Starbucks hopes to add an exterior sign that will project from the Broadway side of the building. The Planning Commission had issues with the sign as proposed, but approved a smaller version that has yet to make an appearance. This 20-unit affordable housing project was approved by both the Planning Commission and the City Council, but a neighboring law firm has sued to reduce the project’s size, putting the project on hold for now. The city originally approved a 91-unit condominium project for this site (just down from the Union Bank, and across the street from the Habitat project site), but the developer was sued in an effort to reduce the height of the project. To settle the suit the developer lopped two stories—and 23 condominiums—off the building’s design. Unfortunately, one of my readers told me that the developer has since concluded that the project is no longer economically feasible, and thus it likely is dead. This is the office building (“Broadway Station”) planned for the corner of Broadway and Jefferson, where Powerhouse Gym is today. My assumption is that once Powerhouse Gym has completed their move—which should occur in a month or two—demolition will begin. 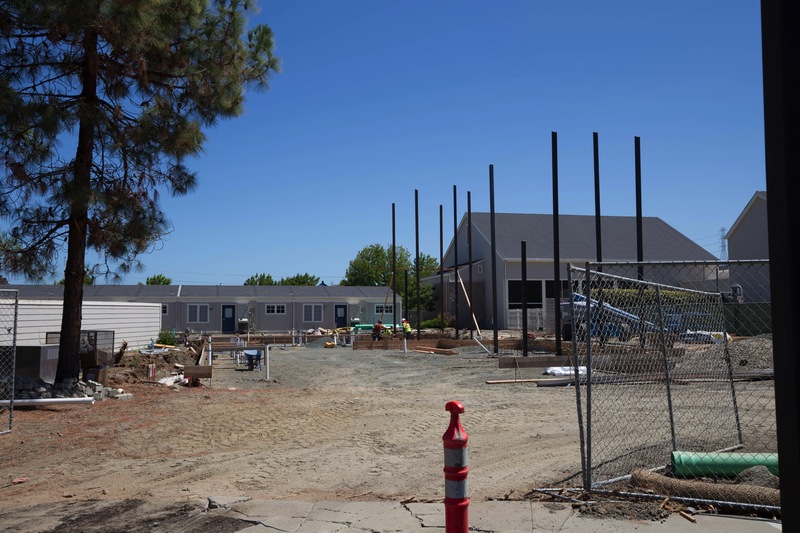 As you can see in the above picture, construction is proceeding rapidly on the expansion of this school in Sandpiper Park (in Redwood Shores). See my recent post—Fact Finding—for details of the office building that is being built at the Five Points intersection (beside and behind Broadway Cleaners, and across the street from Harry’s Hofbrau). As you can see from the above picture, the three-story, 268-space garage, which will sit up against Highway 101, is well underway. This huge project is moving right along. I recently wrote about it in my post Strolling Along Fifth Avenue, and have little to add at this time. It appears that the lowermost of the two parking levels is done, and that the second level is nearly so. Thus, construction of this six-story, 90-unit apartment building at the corner of Jefferson and Veterans is well underway. The exterior of this new school’s building on the Oracle campus (shown above) appears nearly complete; work on the interior is likely the main focus now. This completely modern campus is designed to accommodate up to 580 high-school students, faculty, and staff. The 175-unit apartment complex that is being built across Jefferson from Sequoia Station appears to have reached its maximum height: five stories of apartments over two levels of mostly above-ground parking. Once the framing of that top level is done, expect to see the exterior finishes get applied. Greystar’s other active project, on the site that formerly held Redwood Trading Post, is slightly behind its nearby sibling; it should gain another story or two before it reaches its ultimate height (seven stories: six levels of apartments, plus one parking level on top of a second subterranean parking level). When complete this building will contain 137 apartments. This eight-story, 350-unit apartment building planned for the block just to the south of Greystar III has been approved, but has yet to break ground. This project is hard to miss: it’s the large (five story) office building that is being erected behind the Fox Theatre. The structure is complete, the roof is going on, and much of the exterior cladding is now in place. This project to build a dozen townhouses on the recently empty lot next to the former Mountain Mike’s Pizza restaurant is now moving along smoothly. The contractors appear just about ready to start forming the foundations. See my post Something in Common for a description of this six-story office project. The exterior is pretty much done; the bulk of the work is now focused on finishing the building’s interior. Our 177-room Courtyard by Marriott hotel is essentially complete and has been open for a couple of months now. There are short construction fences blocking off one or two of the surrounding walkways, but for all intents and purposes this project—which is still listed on the city’s website as “Under Construction”—is done. 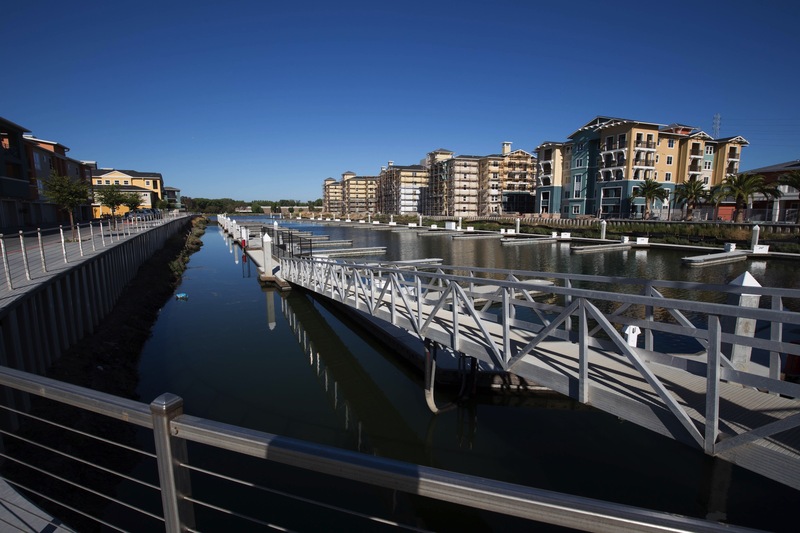 This development on the site formerly known as Pete’s Harbor consists of about 400 apartments plus a small public marina (shown above). It is not quite complete but has started leasing—and indeed a number of the units appear to be occupied. Perhaps more importantly for those of us who don’t live there, the public trail that wraps around the bulk of the development is now open. Park in the public parking lot designated for the Don Edwards San Francisco Bay National Wildlife Refuge, walk out to and across the street towards Bair Island, and then follow the sidewalk towards and then around the Blu Harbor development. You’ll find some great views of Bair Island and the bay from this new section of the Bay Trail. 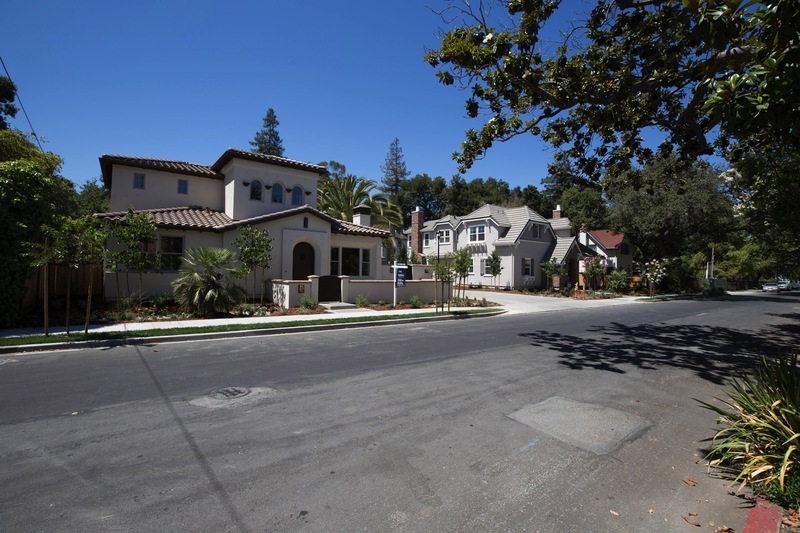 The first of the eight homes at “The Grove” (on Finger Avenue, just up from El Camino Real) appears to have been sold, and one or two others are for sale. The rest are nearly done. That completes the list of approved or under-construction development projects in Redwood City, at least for now. 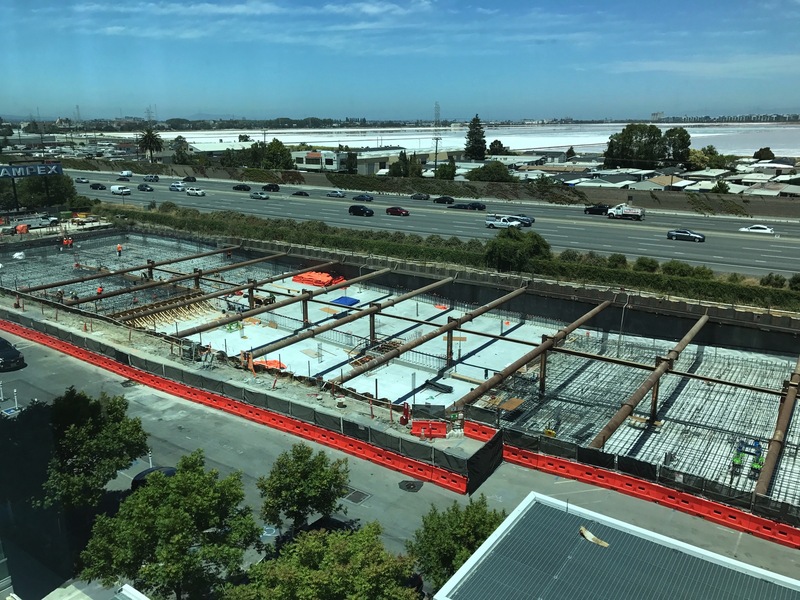 Building activity may feel somewhat stalled on the surface, but as the rather lengthy list of projects above attests, there is a great deal of construction activity going on in Redwood City right now. Given that amount of activity, and given the increasingly vocal resistance to each newly proposed project, it appears that future projects will have a harder time gaining approval from the city. However, the stakes are too high and the opportunities are too great for developers to just fold up their tents and leave. Thus, the proposals will continue to be submitted to and considered by Redwood City’s Zoning Administrator, Planning Commission, and City Council. And I, for one, will continue to be entertained by the process of approval (or not). Thanks for the thorough update on all these projects. Looking forward to seeing them go up! The reality is we’re never going to build enough housing to support all these additional jobs…nor would many people in this community want that level of additional housing built, myself included. Do you know much or follow progress on the Dumbarton Corridor study? Having recently visited Livermore I never actually realized there’s active train service via Amtrak ACE from Livermore (continues out to Stockton) to DT Sanjose. You probably mentioned it during the post a while back about local train corridors but it must have went over my head. The east side of the Dumbarton rail line connects to the ACE line not all that far into Fremont. Facebook keeps throwing additional money at studies to rehab the corridor as they’re under pressure to figure out how to get so many employees to their campus without completely devastating the roads (many would argue that’s already happened). Rebuilding a rail bridge across the Bay is likely a massive undertaking and probably wouldn’t happen until the section from RWC to East Palo Alto is first rebuilt. Nevertheless I’d imagine it’d go a long ways to help balance the local jobs/housing/traffic issues. Lots of land between Livermore and Stockton for future growth. Livermore itself has a very pleasant downtown and affordable housing compared to RWC. While I get why Livermore and the surrounding towns are more affordable now, if you could jump on a train in Livermore and be in RWC in under an hour…it’d become a lot more appealing to many. Not a ton of physical constraints to limit growth between Livermore and Central Valley so hopefully prices would stay somewhat stable(other than water I guess?) Of course it’d probably be better if companies would just expand into the far East Bay…but there will always be a demand to be close to Stanford/Sand Hill/Palo Alto etc. and we already have a huge amount of pent up demand of affordable housing. Thanks Greg for the informative and mind-numbing list. Combine this with six more approved major projects yet to break ground and fourteen MAJOR proposed projects yet to be approved, and this gives us the most pro-development community on the entire peninsula. This incredible rate and pace renders it impossible to address impacts and infrastructure. How’s that “pause” working out for us? Re: Hallmark House – I was just thinking about writing you to ask about this – good timing. It is such a disturbing property, now 4 years (July 7, 2013) after the fire, still no action. The city needs to begin seize and demolish procedure. It certainly would be better as an empty lot than the eyesore and other associated problems, such as diminished property values around it. Re: 150 El Camino. I’m happy to see that their actively working on that property. But now the old pizza place looks like a disaster. I can’t imagine another restaurant or anyone wanting that building as it is currently designed. It would be great if the 150 El Camino builder bought it, and put more units on that parcel as well. Keep up the good writing. You have become my best source for local development. Thanks for the kind words, and thanks for reading! As for the old Mountain Mike’s restaurant, apparently a developer proposed something new for that site but the project has already fallen through. Nevertheless, if I were a betting man I’d put my money on some sort of development project there; I just can’t believe that that building will find new life as a restaurant.